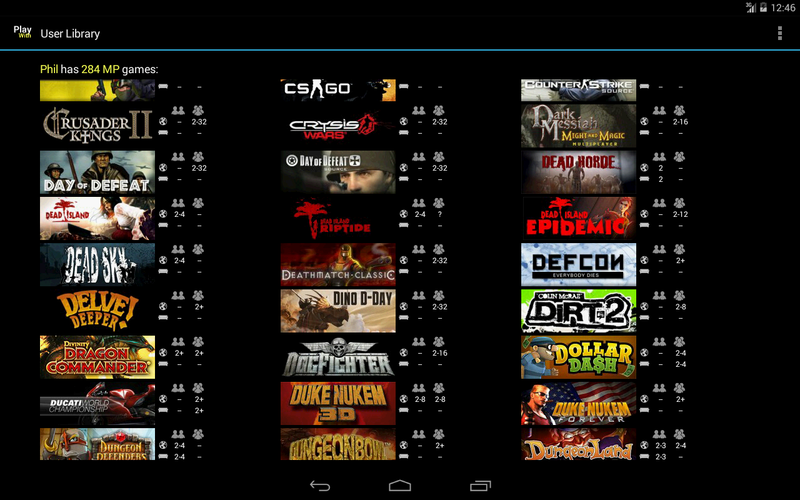 PlayWith is a utility App for Steam users which helps them to find games they can play with their friends. 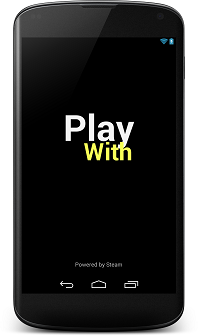 The user selects which friends he wants to play with and the App checks their libraries for common games that support that many players and displays them. 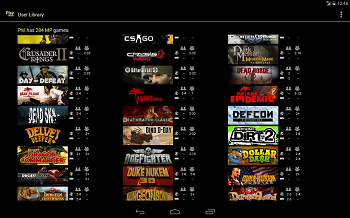 Additionally the user can search for games that support local multiplayer modes. 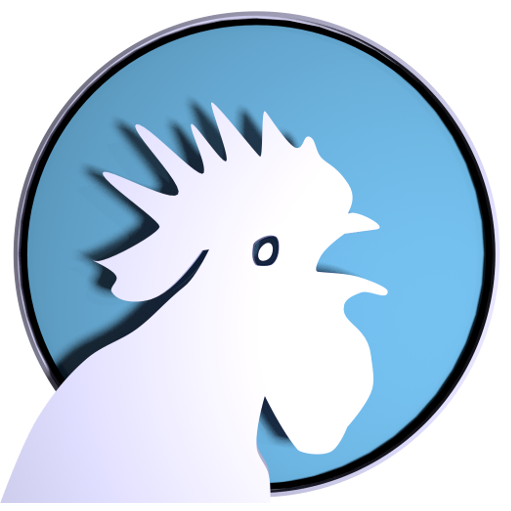 The App uses the Steam WebApi to get the required information about the user, his friends and the games they own directly from Steam. All shown data is without any kind of warranty. 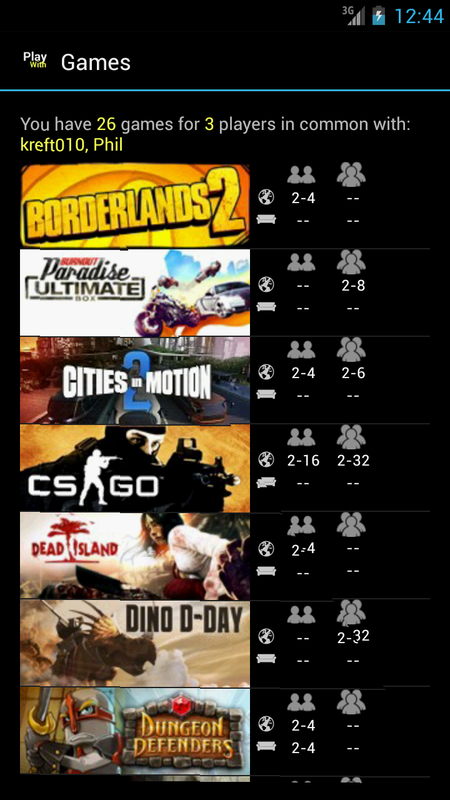 Depending on the size of the friends list and the amount of their games the App can generate some traffic during the initial setup so relying on a WiFi connection is recommended. Neither the developers nor the app itself is in any kind affiliated with Valve or Steam. NO WARRANTY. VALVE PROVIDES THE STEAM WEB API, STEAM DATA, AND VALVE BRAND & LINKS "AS IS," "WITH ALL FAULTS" AND "AS AVAILABLE," AND THE ENTIRE RISK AS TO SATISFACTORY QUALITY, PERFORMANCE, ACCURACY, AND EFFORT IS WITH YOU. TO THE MAXIMUM EXTENT PERMITTED BY APPLICABLE LAW, VALVE , STEAM GAME PUBLISHERS AND DEVELOPERS, AND THEIR SUPPLIERS MAKE NO REPRESENTATIONS, WARRANTIES OR CONDITIONS, EXPRESS OR IMPLIED. VALVE, STEAM GAME PUBLISHERS AND DEVELOPERS, AND THEIR SUPPLIERS EXPRESSLY DISCLAIM ANY AND ALL WARRANTIES OR CONDITIONS, EXPRESS, STATUTORY AND IMPLIED, INCLUDING WITHOUT LIMITATION (A) WARRANTIES OR CONDITIONS OF MERCHANTABILITY, FITNESS FOR A PARTICULAR PURPOSE, WORKMANLIKE EFFORT, ACCURACY, TITLE, QUIET ENJOYMENT, NO ENCUMBRANCES, NO LIENS AND NON-INFRINGEMENT, (B) WARRANTIES OR CONDITIONS ARISING THROUGH COURSE OF DEALING OR USAGE OF TRADE, AND (C) WARRANTIES OR CONDITIONS OF UNINTERRUPTED OR ERROR-FREE ACCESS OR USE. The mobile application PlayWith does not collect any kind of personal information. It stores the Steam Profile ID the user enters and all associated data it downloads via the Steam Web API. None of this data is transmitted to any other organization than Valve. In short: No personal data collected, none shared. Except, of course, what Google automatically transmits every time an application gets installed: we get informed about the number of current and total installations of this App in combination with the countries the users hail from, their service providers and type of phones. Those informations are all anonymous.